Match the cubes, earn high scores and rake in cash prizes in this addictive multiplayer puzzle game. Cubis For Cash takes the fun of match 3 games and pairs it with the thrill of real cash betting to create the most enjoyable gameplay possible. Play in real-time against Cubis players around the world! Most match 3 games take place on a flat game grid (Bejeweled, Candy Crush). However, Cubis For Cash offers a fresh new spin by putting three dimensional space into the mix. When you boot up the game, the square game grid is viewed at an angle, and this gives you a real sense of space. You can shoot blocks onto the game grid from the two adjacent sides of the grid that are closest to you. Each time you shoot a cube, it can nudge the cubes on the board a space over if the board is empty enough for them to move freely. The game starts you out with a set number of colored cubes on the grid, and your job is to add to it, make matches of cubes of the same color and clear the board. If you make matches of three or more, the cubes will disappear. As you play, special star cubes will appear on the board. If you match the star cubes up, all of the cubes of that color will be removed from the board. This game rewards speed. The faster you clear the board, the bigger the multiplier. The more boards you can clear before the timer runs out, the bigger your multiplier will be as well. As you progress through the game, you will eventually see metal cubes. These guys exist to keep you from making a clear shot across the board! There are also multicolored cubes that are cracked; shoot a cube at those to make them crumble and disappear! Overall, Cubis is all the fun of a typical match 3 with a refreshing three dimensional twist that sets it apart from the rest. 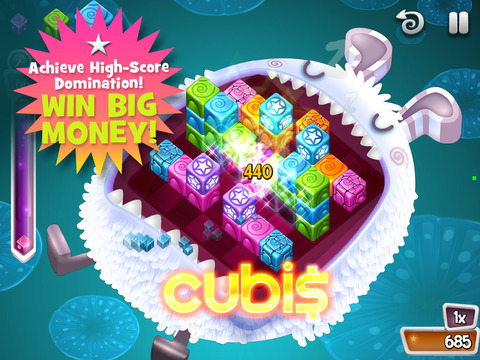 The sound and graphics in Cubis For Cash are slick and polished, with a bright color scheme that's fresh and vibrant. Cubis For Cash matches you with other players in realtime from all across the globe! You can boot up a game any time, day or night, and enjoy putting your matching skills to the test against a global community of players. The game matches you with other players quickly so you can play fast! 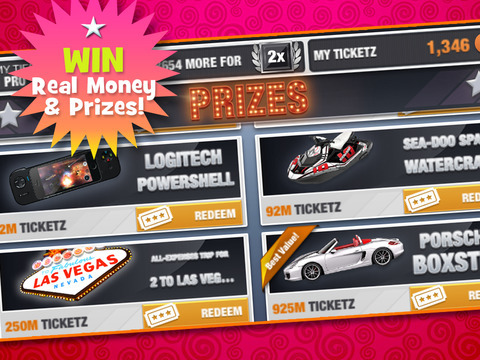 Play for Free or for Cash! You can play Cubis For Cash for fun using practice tokens, or you can raise the stakes and put your money where your mouth is with real cash betting. It takes the pulse-pounding gameplay of a regular Cubis match and ups the ante considerably. There are tons of match 3 games out there today. Bejeweled and Candy Crush are the most well known, and these two hits have spawned a legion of clones that offer gameplay that's virtually the same. Does Cubis For Cash manage to stand out from the crowd? Read on to find out! Most match 3 games are flat. The game grid is flat if you're swapping adjacent pieces, it's flat if you're shooting pieces onto an existing grid, etc. Flat is the name of the game. But then there's Cubis. Cubis is three dimensional. The game grid has a very clear sense of space. Overall, Cubis feels like a strange hybrid of Tetris, Bejeweled and Q*bert, and it totally works! Cubis stands out from other games because you're playing in three dimensional space. The cubes on the grid can actually get in the way of your vision if the stack is high enough. You shoot cubes onto the board from the two adjacent edges of the square grid that are closest to you. You can move all around on those two sides to line up the perfect shot. When you let the cube fly, if it creates a match of 3 or more of the same color, those cubes will disappear from the board. If not, the board will become more crowded. Each of the shots has the potential to move existing cubes on the board one space if the board isn't too full. Now, as you play, you will start accumulating multipliers. You earn them various ways. The more boards you clear before the time is up, the bigger the multiplier. The more star cubes you clear, the more multipliers you earn. Etc. The game rewards fast gameplay that's also skillful. You can't just shoot cubes without planning and expect to do well in Cubis. The graphics in Cubis For Cash are excellent, with bright, brilliant colors that are a treat for the eyes. The cubes have a candy coated look to them, and the special effects that kick in when they're cleared from the board look wonderful. Overall, Cubis For Cash has visuals on par with Bejeweled and Zuma.The background behind the game board deserves a special mention, too. It has an Alice in Wonderland meets outer space kind of vibe that's just lovely. The music is perfect as well. It's subtle and engineered for focusing, providing the perfect backdrop for an intense matching session. One issue with the sound is the fact that the timer starts ticking ominously, drawing attention to itself during those critical last seconds of the round. Unfortunately, I ended up turning the sound down, which is a shame. I wish I could just mute the sound effects without muting the music. 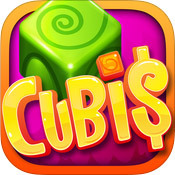 In Cubis For Cash, this game pairs you up with players from all over the world. The game does a good job of matching players quickly, meaning that each multiplayer game launches within seconds. This is a far cry from the long waits that some other multiplayer games put you through. You can load up your account with money to make wagers on your rounds. This is amazingly fun, taking an already engaging game and making it a pulse-pounding experience. However, if you're not yet ready to pay, you can still play and enjoy the game using the practice tokens. Another thing that I appreciated is the fact that the store is very clearly marked within the menu, making it borderline impossible to accidentally add money to the game. You'll only be playing with cash if you decide to do so. As you play Cubis For Cash, you will start working your way through the ranks. Ranks are important because they influence your position within the Leagues, and the Leagues decide how much you can earn during the tournaments. This game randomly assigns new players a username, which eliminates those 'Oh my gosh, is every name taken?' moments during sign up. You can change your name from that assigned one once, and only once. This game has serious long term replayability and appeal, so being able to change your name more than once would have been ideal. Chances are high that the band, TV show or movie referenced in the username will be 'so yesterday' tomorrow, but you'll still want to be playing Cubis For Cash. So choose your username with care! Cubis For Cash takes the tired and well-worn match 3 genre and does something unique and unexpected by putting 3D space into the equation. The stacks of blocks, the unique way in which they are added to the board, the multipliers and the fast-paced gameplay all come together to create a game that's unlike anything else out there. Adding realtime multiplayer and real cash betting takes this excellent game and makes it even better, creating a must-play game that's unforgettable. Overall, this game scores a 9.0: Superb.